The entire line of Flip Video pocket camcorders now records in high definition--and the newest models do it at a higher frame rate. Cisco today phased out the remaining standard-definition models of the Flip family and introduced revamped versions of its Flip UltraHD and Flip MinoHD models. The new camcorders don't look much different from last year's models of the UltraHD and MinoHD, but they offer a few enhanced features compared to the previous generation of devices. Each of the new pocketable video cameras can record 720p video at a frame rate of 60 frames per second (up from 30 fps at the same resolution in previous models), and they add digital image stabilization to help prevent shaky footage. The combination of a faster frame rate and improved stabilization should yield smoother-looking video than previous versions could produce. Frustratingly, the most intriguing new addition to the Flip line is limited to the new 2-hour (8GB) Flip UltraHD model. The higher-capacity UltraHD offers a proprietary FlipPort connector on the bottom of the device, which you can use to add accessories to the camcorder. It's similar to (but not compatible with) the proprietary connector on the bottom of Apple's iPod, and some established iPod accessorizers are busily developing accessories for it. According to Cisco, Blue Microphones and Scosche are creating microphones for the new "Designed for Flip" accessories program, while iGo is working on a portable charger for the new camcorder. Aside from those FlipPort-based accessories, companies are also developing third-party accessories that will work with any Flip model, such as a wide-angle lens attachment from Bower, a portable projector from iGo, and waterproof cases from Aquapac and Ikelite. Though the new FlipPort connector appears only in the 2-hour UltraHD model, Cisco plans to add the connection port to future versions of the MinoHD. 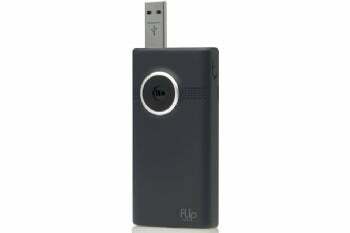 The first wave of compatible FlipPort accessories should be available by the end of the year. The new UltraHD additions to the Flip arsenal include a 2-hour version (8GB, priced at $200) and a 1-hour version (4GB, priced at $150). The 2-hour UltraHD camcorder can run on three AAA batteries or on an included USB-rechargeable battery; the 1-hour model uses AA batteries or a separately sold rechargeable battery. Both new UltraHD models have slimmed down a bit front to back, and the higher-capacity UltraHD offers the new proprietary FlipPort to use with the upcoming "Designed for Flip" accessories. Beyond the 60-fps capture rate and the stabilization feature, however, not much has changed: Each model includes a flip-out USB connection (for offloading clips and charging the battery), video captured as MP4 files, an HDMI-out port, and FlipShare software embedded on the device. The 2-hour UltraHD is available in black, white, or a customizable design via the Flip Online Store; the 1-hour model is available in white, blue, magenta, or a custom design. Cisco also announced two new MinoHD models as part of its late-2010 refresh: 2-hour (8GB, priced at $230) and 1-hour (4GB, priced at $180) versions of the third-generation Flip MinoHD. Both are more compact than the new UltraHD models, but neither has a user-replaceable battery. Along with 60-fps shooting and digital stabilization, the new MinoHD camcorders have a flip-out USB connector, MP4 video, an HDMI-out port, and embedded FlipShare software. Both new MinoHD models also represent a slight step backward in the build-quality department. We loved the durable, all-metal exterior of the second-generation MinoHD, but the new models change it up with a durable-but-plastic coating. On a brighter note, both new MinoHD models still offer a durable all-metal USB connector. The 2-hour Flip MinoHD is available in black or custom-design options, while the 1-hour model is available in silver or custom-design options. 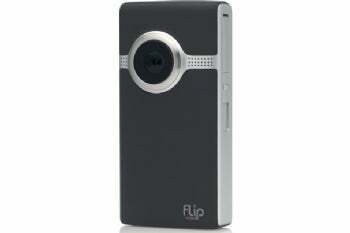 All of the new Flip Video pocket camcorder models are available immediately via TheFlip.com. It doesn't offer the same impressive video quality as its predecessors, but the final version of Cisco's Flip UltraHD pocket camcorder still dominates the field in ease of use.